Mantis Miniatures from Poland is well known for their 1/35 scale figures. They have a variety including World War I, II and modern soldiers, civilians and pin-up girls. Majority of these high quality figures is WW II Germans. Inspired by realtime photos, company added two Eastern front German soldiers in heavy clothing to their product range. The figures have a very good match to display together on a winter scene and available as a combo kit 35124. After formerly reviewed 35123 - German in Sheepskin coat, second figure 35122 - German in Snow camo depicts a soldier in rare clothing on a pointing pose. Inside company’s standard box labeled with a photo of the figure painted by Artur Miniszewski , parts are inserted into a transparent zip-lock bag. Figure is sculpted by Nino Pizzichemi in 1/35 scale and cast in medium grey resin. It comes in 2 pieces ; full body and right arm. Parts are very clean that no cleanwork will be needed. Just remove casting blocks and paint. He wears German standard uniform jacket M36 Field tunic, snow camo trousers and long boots. Over the uniform, he has snow parka - M41 Schneetarnjacke, originally a Gebirgsjager issue but became apparent at all branches of Wehrmacht. It was an extremely wide, open-front jacket which could fit over the heaviest clothing. Besides cloth folds and wrinkles, details of the jacket like front buttons, slash pockets on sides, wide sleeves with no cuffs and big hood without drawstring are all very well sculpted. Facial details are clean and crisp. He wears a Toque, tubular head scarf worn as a neck warmer or pulled up under the helmet. Right arm shows a pointing pose and makes a nice fit to the shoulder. He wears Woolen gloves and knit texture is well defined. Figure is nicely sculpted in a great likeness to the soldier on the reference photo. Casting is very clean. Assembly will be speedy with only two parts and no cleanwork. 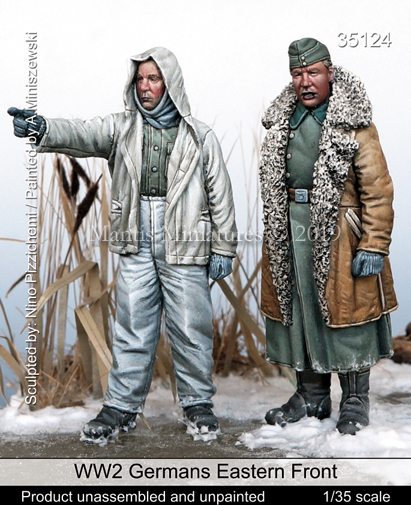 It can make a great scene with German with sheepskin clothing or can be a part of any Eastern Front diorama or vignette. Highs: Very nice sculpt in crisp details, flawless cast with no need for cleanwork, easy to assembly with 2 parts and good fit. Lows: No lows for this product. Our Thanks to Mantis Miniatures! Very nice. And no binoculars. But he does appear to be pointing. But he does appear to be pointing. [/quote] That's his finger gun! But he does appear to be pointing. [/quote] That's his finger gun! [/quote] Looks like he's pushing an elevator button. "Where ist die elevator?" "Werner, we're in the middle of a snowstorm on the Russian Front!" "I think the cold has finally gotten to him-"